The tearsheet for SunBriteTV's Signature Series 4660HD gets right to the selling point when it describes this 1080p HDTV as a True Outdoor All-Weather LCD Television for permanent outdoor installation. Basically, the folks at SunBriteTV encase their TVs in a rugged, weather-hardy shell that can withstand cold winters, (down to a bone chilling -24 degrees F) and hot summers, (fan cooled to operate in Death Valley like temps, up to 122 degrees F). The TV inside of the 4660's moisture and dust resistant casing is an old-school CCFL LCD screen, which is backlit with fluorescent lights and not the newer technology LEDs. The 4660HD's picture quality is quite acceptable, especially for an outdoor television. 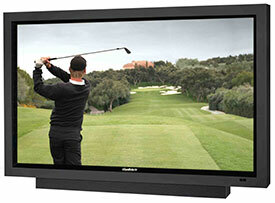 If you want an LED backlit display, then you can super-size to SunBriteTV's 65" Signature Series 6560HD model ($5995). SunBriteTV does not offer a 3D unit. When the CCFL LCD display is dialed in, the picture quality is quite respectable. But I found that it had a tendency to be inconsistent in its color balance. Of course, when you are trying to watch TV outdoors with the sun bouncing off the swimming pool and glaring in your eyes, you may never notice. The audio quality is good, and loud enough to hear during a BBQ party. The SunBriteTV 4660HD is not one of those feature-laden Smart TVs. It doesn't have an Internet connection, there are no apps, you can't stream Netflix, all of which is not necessarily a bad thing. If you want those options, hook the TV up to a network connected Blu-ray player or a Roku-type device. The lack of all those Smart TV features makes this a fairly easy TV to use day to day. But I found the initial picture setup took more tweaking than many of the TVs I have been reviewing lately. If you can find a new CCFL backlit LCD TV any more, a 46" model would probably cost less than $500. Therefore, you are paying a pretty penny for the All-Weather encasement that SunBriteTV provides. Only you can decide if this protection is worth it.